Okay. So you’ve been reading all the wonderful articles on The Work at Home Woman, and now you want to join the growing workforce of “remote” employees. Well, the truth is you’d be in good company with this fast growing sector of American workers. In fact, according to a study by globalworkplaceanalytics.com, approximately 3.7 million workers, or almost 3% of the workforce works from home at least part of the time. There are lots of ways to find work-from-home positions. For starters, this site is a wonderful resource. You could conduct some searches on the big job boards like FlexJobs, Indeed, and CareerBuilder, too. But what about social networking sites like LinkedIn? Does the popular professional networking site offer some different options for finding telecommuting opportunities? The answer is a resounding YES! The first logical step is to search the jobs posted on LinkedIn. All you have to do is click the “Jobs” link at the top of the page, and you can then begin your search in the search tool. There are some important keywords you’ll want to include in your LinkedIn search to find the work-at-home jobs, including keywords like telecommute, telecommuting, work from home, remote, remotely, virtual, or home-based. You will also want to use combined terms that speak to your expertise. So in other words, if you are a writer, a search like “telecommute” and “writer” would deliver a nice selection of jobs to look into. The second thing to do is to connect with the companies who are known for having a remote workforce. The Work at Home Woman has already compiled a great list of larger organizations that hire virtual workers and offer benefits, so that would be a great place to start. You can also look to see what companies come up in your job search as described above, and opt to follow some of those organizations. Lastly, FlexJobs has compiled a list of the Top 100 Companies with Remote Jobs for the past three years that would also be very useful. Once you find a company you are interested in, simply search the company’s name, click through to their page, and click the yellow “follow” button in the upper right-hand corner of the page. By following the company, you can click the home page tab and stay up to date with any updates they post or click the careers tab and see any jobs they have posted. And if you’d benefit from having an insider at the organization, you can look to the right of the page to see who in your network may work for (1st-degree connection) or be connected to someone who works for (2nd-degree connection) the company you are researching. I think one of the most underutilized components of LinkedIn is the groups. There are groups for almost anything you could imagine. And, as you have probably guessed, there are even groups dedicated to telecommuting. One of the largest general groups is FlexJobs (with over 15,000 members), but there are telecommuting groups for writers, IT professionals, social media marketers, PR experts, and the list goes on and on. You can locate these groups by typing in your interests in the top search bar and using one of the work from home search terms we described and selecting the groups that come up in your search. Once you join one of these groups, you can connect with like-minded professionals in your geographic area, get plugged into the latest job openings, trends and thought leaders in your industry, discover compelling content to share with others, or even establish your own expertise by getting involved with discussions with your fellow group members. 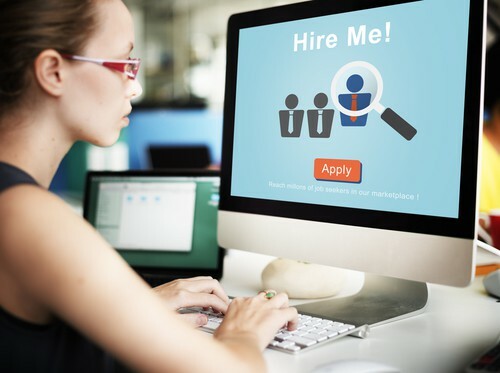 When used properly, LinkedIn can be a powerful tool in your job search arsenal. 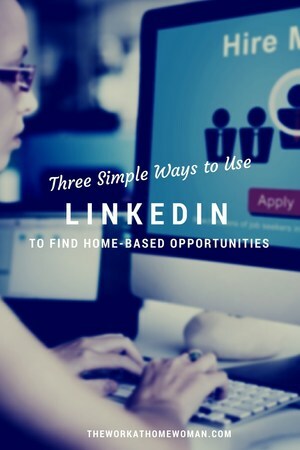 How are you leveraging LinkedIn to find work-from-home opportunities? What groups are you a part of? Do you have a success story you can share that demonstrates how LinkedIn worked for you? Want more LinkedIn tips? In this post, Erica shares five tips and 15 resources to reboot your LinkedIn strategy and fast track your growth as an at-home professional. I have been reading your articles and find this truly beneficial for whom, who are seeking for work from home jobs. The biggest advantage of using LinkedIn is that it’s the quickest and easiest way to be found or find recruiters. Additionally, your profile will also be well positioned for the future trends. Hi Cara, So true! I still get recruiters messaging me via LinkedIn for nursing jobs, even though I haven’t dome nursing in years.